Those of you who live in the Madison area have probably seen or heard of the “Bucky on Parade” public art project. 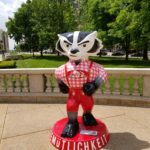 This involves 85 different Bucky Badger statues in the Madison area, each one 6 feet tall and 160 pounds. Every statue is transformed by a local artist into a unique representation of Bucky. Here is a link to the WMTV story. Tim found the “Gemütlichkeit Bucky” near the Capitol and took this picture. Click on the thumbnail to see the larger image. For more information on the art project, here is the official Bucky on Parade web site. There are maps on the web site showing the location of all 85 of the Buckies. The project runs from May 7, to September 12, 2018. 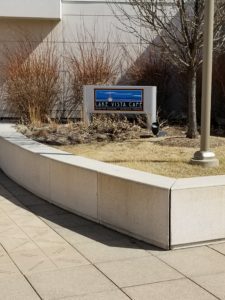 This entry was posted in Events, Traditions, Heritage and History on May 25, 2018 by Joe. 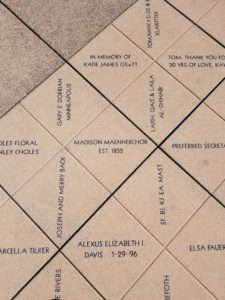 When the Monona Terrace was being built, the public was offered the opportunity to purchase commemorative tiles for placement on the Terrace Roof Garden. 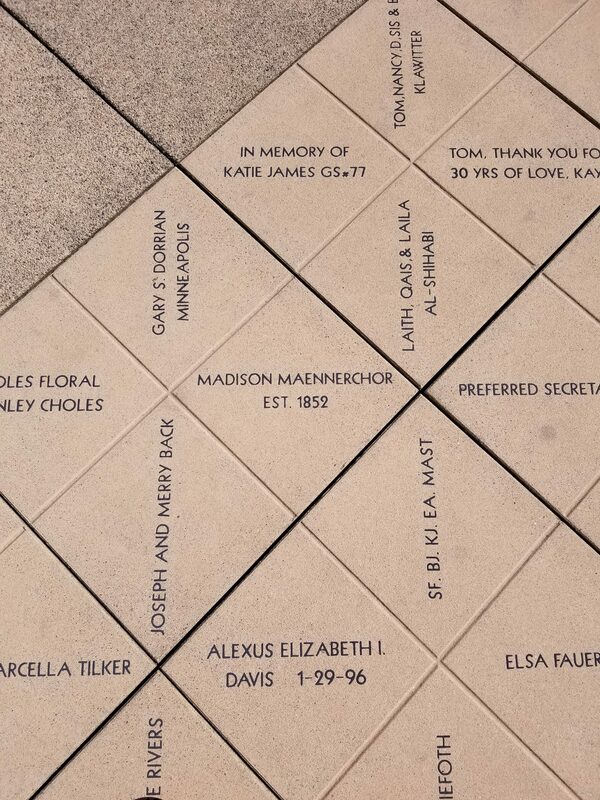 The other day I finally had a chance to locate (again) the tile purchased by the Madison Männerchor at the time. 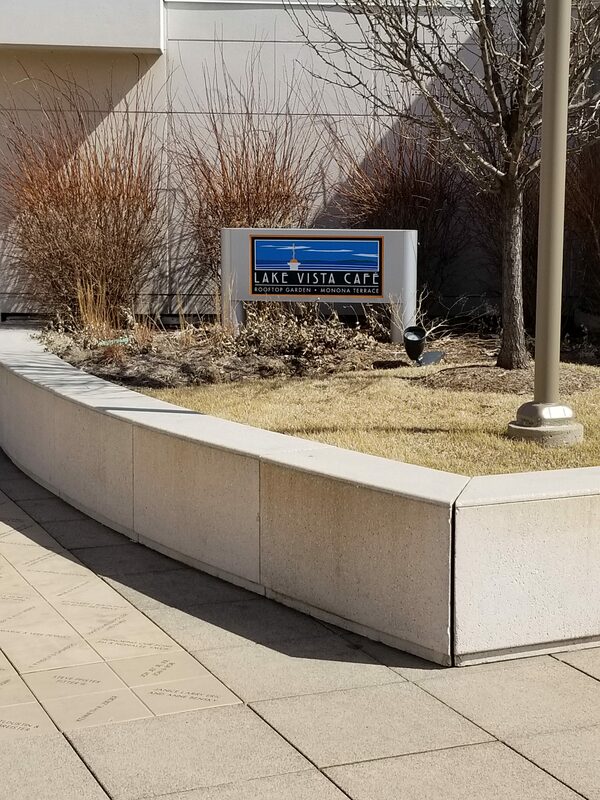 It is located in the southeast corner of the Roof Garden, near the sign for the Lake Vista Cafe (see picture). This entry was posted in Men's Choruses, Traditions, Heritage and History on March 24, 2018 by Tim. Wisconsin Public Television’s new documentary on the polka traditions of Wisconsin was shown this month. It is really well done and a pleasure to watch. If you missed it, you can watch it online. Here is the link: Polka! Most of the documentary was filmed in 2016, and there is some footage of the Essen Haus Oktoberfest, including some music from the Madison Maennerchor! This entry was posted in MMC Activities, Traditions, Heritage and History on March 26, 2017 by Joe. This entry was posted in Max Kade Institute, Traditions, Heritage and History on September 17, 2016 by Joe. 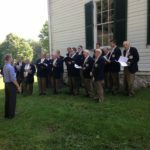 On Sunday September 11, 2016 we took part in the Annual Service at First Lutheran Church in Middleton. 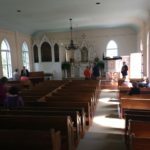 The church is no longer used for regular church services, it’s used mostly for weddings in the summer, but every fall there is an annual service. This year it was a special anniversary: the current church building was constructed in 1866 so this is the 150th anniversary! 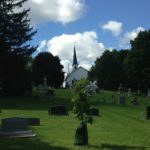 An addition was built in 1884 with the steeple and a new church bell. The church was added to the National Registry of Historic Places in 1988. 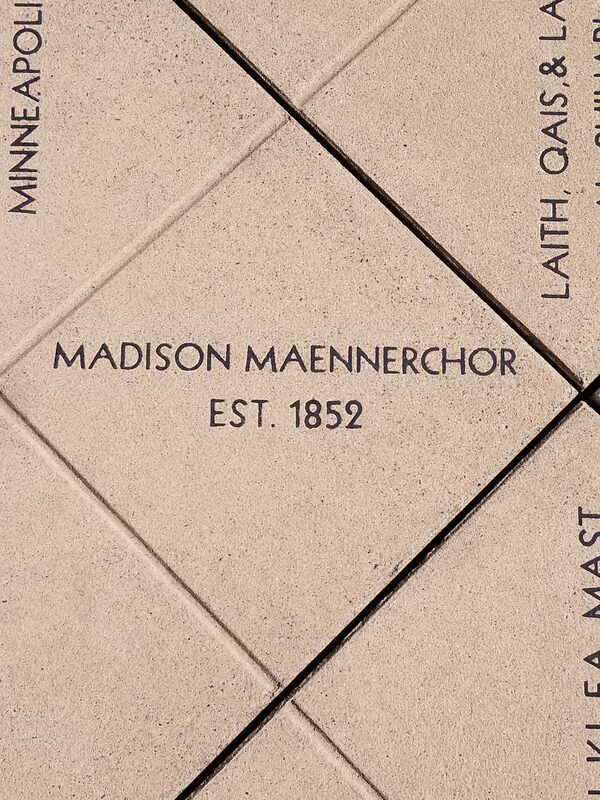 The congregation was founded in 1852, which coincidentally is the same year that the Madison Maennerchor was founded. It was a beautiful day for the service and it was great to be there and to sing during the service. Below are a few photos; as always click on the thumbnail to see the larger image. This entry was posted in Events, MMC Activities, Traditions, Heritage and History on September 14, 2016 by Joe. 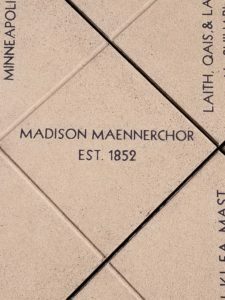 The Madison Männerchor was mentioned in two places in the Winter 2015-2016 edition of the the “Wisconsin Magazine of History”. In the article, “Green Turtle Soup, Lobster Newburg and Roman Punch”, the MMC is referred to as “Suitable entertainment…” on page 19 and listed on the reproduced menu from 1901 on page 21. This entry was posted in Men's Choruses, Traditions, Heritage and History on December 23, 2015 by Tim. Hello friends–please spread the word and invite your friends! Here’s a chance to enjoy a great afternoon of entertainment this Sunday, October 13 at the annual Wine Fest. It’s a friendly mix of Austrian Volksmusik, Viennese songs and operetta, humor and skits, and you get to dance and sing along! Enjoy Authentic Austrian Volksmusik, Elegant Viennese Song, Skits, Good Humor, Old-World Culture and a chance to sing and dance along! Featuring the exquisite zither music of Kurt von Eckroth and the graceful singing of soprano Rachel Renee. Tickets $8.00 at the door on the day of the event—no pre-sales. Additionally, fine food and beverages will be available from the Austrian Club and from the Schwabenhof bar and restaurant staff. This entry was posted in Traditions, Heritage and History on October 9, 2013 by Morris. From beer and bratwurst to farming and educational advances, the influence of Germans in Wisconsin is everywhere. Join Cora Lee Kluge, UW Professor of German and Co-Director of the Max Kade Institute for German-American Studies, as she discusses how and why Wisconsin became the most German state in the U.S., as well as the lasting impact of German traditions and customs on our lives today. Savor the flavors of Germany with a meal catered by Blue Plate Catering that highlights the best of German cuisine. Cost to attend is $25 and WHS Members receive a 10% discount. Hurry! These events fill fast! This entry was posted in Events, German Language, Max Kade Institute, Traditions, Heritage and History on July 31, 2013 by Tim.